While the tension between state and federal laws has created a difficult situation for cannabis users, there’s another factor that is complicating the changing attitude towards weed: hospitals. Though it isn’t legally mandated, many hospitals won’t allow people who use weed to be placed on organ transplant waiting lists. According to an extensive report from Buzzfeed, policies for treatment of patients who need an organ transplant that test positive for cannabis use varies from hospital to hospital. The United Network for Organ Sharing manages the U.S. organ supply and it has no official policy for drug or alcohol use. 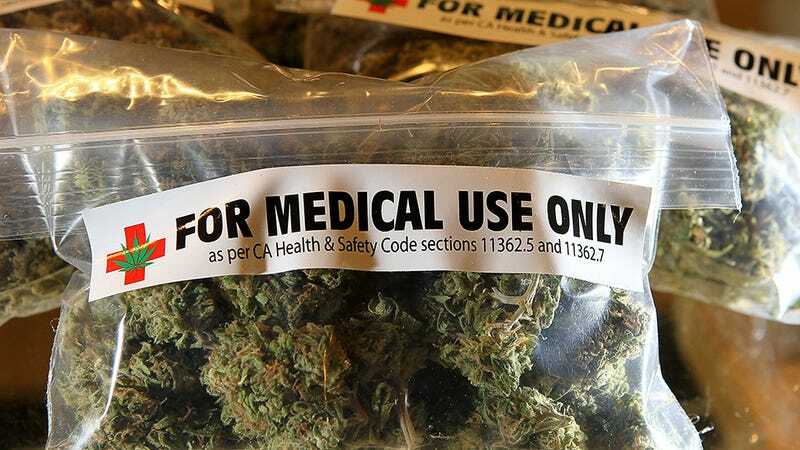 If someone uses weed for medicinal or recreational use and they need an emergency organ transplant, they just have to hope they end up in a hospital that doesn’t consider that to be a problem. At Massachusetts General Hospital, a hospital in a state that has legalized both medical and recreational marijuana, it’s a far different story. “If someone is abusing marijuana — either medically or recreationally — they would not be a candidate for transplant,” a spokesman said. At the University of Utah Hospital, where Riley was initially treated, cases are evaluated individually, a spokeswoman said. “We do not have a specific policy regarding cannabis, but generally speaking, we do not transplant organs in patients with active alcohol, tobacco, or illicit drug use or dependencies until these issues are addressed, as these substances are contraindicated for a transplant,” she said. The state of Utah bans both medical and recreational marijuana except for a very limited program geared toward treating people who suffer seizures. The University of Vermont Medical Center, in a state that allows medical marijuana, said it has no policy related to cannabis, “but our position with patients is no smoking. Period.” At UW Medicine in Washington, where cannabis is legal for medical and recreational purposes, smoking of any kind is discouraged, but using cannabis “doesn’t necessarily exclude” a patient from a transplant. Some hospital transplant centers are amending their policies. At Yale-New Haven Transplantation Center at Yale University, a zero-tolerance policy on cannabis evolved to a 30-day window for potential transplant patients to clear cannabis from their systems. In California, the first state to legalize the use of medical weed, legislation has attempted to address this issue. Denying a patient an organ solely based on their use of medical cannabis has been outlawed. But Stanford Health Care at Stanford University in Northern California still considers any kind of drug use a potential reason to leave a patient off of the transplant waiting list. There are many different reasons that physicians give for their decision to treat cannabis users differently than other patients. Some say that inhaling the smoke can lead to fungal infections. Others worry that cannabis users aren’t as reliable as non-users and might not be as responsible with prescribed regimens to take care of their organs. These fears are mostly related to the short supply of organs, rather than a moral issue. Arthur Caplan, head of medical ethics at the NYU School of Medicine, tells Buzzfeed that many hospitals are “looking for some way to kick people off the list,” due to the high demand. More than 118,000 people are currently waiting for a suitable organ. One big problem is that cannabis research is still very limited. That can lead to attitudes like the aforementioned notion that cannabis users are lazy and irresponsible. Tamra Howard had to spend 20 years fighting against this cliche. A resident of Los Angeles, Howard needed a kidney in the mid-’90s. She was on dialysis and didn’t like the pain medications she was prescribed. She found that weed was far better and despite being rejected for a transplant nine times, she persisted in using the only option that would kill the pain. In 2016, one year after California passed its law legalizing medical cannabis, Howard was approved. Today, she is alive and well. Others, like Norman Smith, have not been so lucky. He died after being denied a transplant by Cedars-Sinai Medical Center because of his use of medical cannabis. Many doctors wish they had more federal guidance. Members of the International Society for Heart and Lung Transplantation will meet this month and one of the focuses of their conference will be on discussing issues relating to cannabis users. Unfortunately, some people in the medical community don’t believe this is a great time to address the issue because the anti-cannabis crusader Jeff Sessions is now Attorney General of the United States. I highly recommend reading the full report, it puts a human face on the issue and shows just how difficult this problem is.